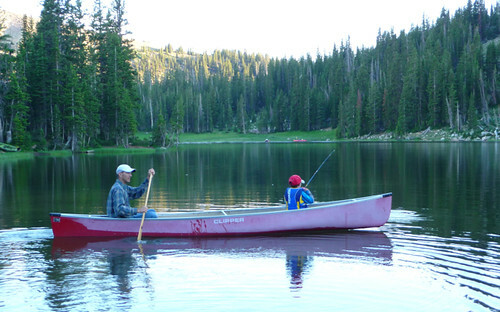 The tent, the canoe, the fishing rods, the sleeping bags…One of the highlights of our summers is packing up all of our camping gear and heading into the Uinta Mountains, east of Park City, Utah. We have our favorite spots, one in particular that is set right on the shores of a mountain lake tucked into the high altitude forest. With cooler temperatures, glassy lake water and placid surroundings, it is nothing short of idyllic. Nestled into the back of the truck, amidst the coolers and food boxes, is our Coleman camping stove, set up with fresh propane tanks and ready to perform dutifully. Our traditional first-night dinner is the family’s favorite pasta dish, noodles coated in basil pesto and tossed with grilled chicken and fresh vegetables. On the following nights, however, we often resort to lack-luster sandwiches or simple soups. We need a new traditional meal and I think these pasta foil packets just might fit the bill. The pasta is cooked ahead of time (at home), rinsed in cold water and tightly packed into a resealable plastic bag. 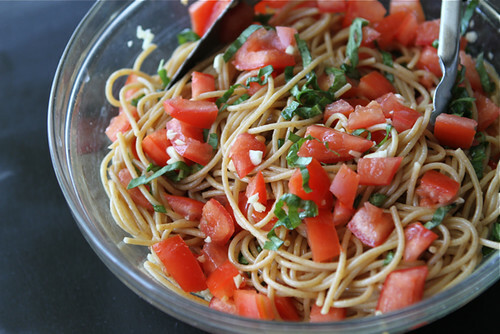 As you are setting the grill over the smoldering fire or lighting the camp stove, toss the pasta with some tomatoes, fresh basil, garlic, salt and pepper. Simply divide the pasta between several pieces of foil, dollop on the goat cheese, seal, and set over the fire. In about 12 minutes, you’ll be rewarded with a warm, flavorful pasta. The best part? Everyone gets to open their own little packet. That’s always a hit with the kids! I have to thank Lindsay of Eighty Twenty for this recipe. Lindsay is a dietitian who believes in the principle of “If you eat wholesome, healthy meals 80% of the time, then you get to indulge a bit 20% of the time.” I can get behind that! Check out her site for recipes such as Almond Hummus (um, yum! ), Bacon Pesto Corn Muffins and Ricotta Cantaloupe Toast. To find the recipe for these pasta packets, and for additional step-by-step photos, head to the Tasty Kitchen blog. I love cooking in foil packets. Easy-peasy and less to clean up! These look fab! Oh my goodness…I could go for that right now for breakfast! That looks incredible and I love that it replaces a more traditional meat and potatoes foil packet. Love how convenience this recipe is. 🙂 Can’t wait to make this on my next camping trip. I love that 80/20 idea. I’m going to remember that. You could possible get me camping again with meals like this. I mean really Dara…goat cheese in the woods? You go girl! What a creative idea! I don’t go camping very often these days but I really wish I had known about this back in the day. My daughter’s family loves camping! They go every chance they get during the summer months. Definitely passing this on to her for their next camping trip. 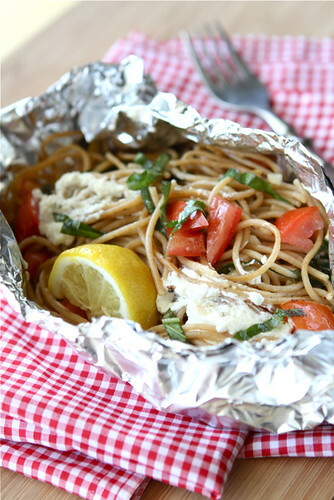 Love the idea of a pasta dish in foil. Thanks Dara!!!!! Sounds like a great philosophy and a great camping meal. LOVE this! Anything with goat cheese and fresh summer tomatoes is calling my name. And portable! This is my kind of camping meal!! I used to love to canoe. We would go up to Algonquin Park every year and go out on the lake. So much fun. I love this meal Dara. I’d have to sub in regular pasta due to my whole wheat issues but I bet it’s just as good. Just not quite as healthy. Thanks for sharing this. Looks very v3ry delish! Loved it. What a fun idea – I’d never think to make pasta packs. Looks like a beautiful summer getaway with your family. Hope you’re having a great summer Dara! Great idea for camping, especially for early in the trip when the cooler is still filled with ice blocks and everything stays nice and cold! For us, the 20% indulgence always comes toward the end of a long camping trip, when we’ve eaten all of the perishables and what’s left are the chips and cookies. Love this Dara, th enoodle pockets. Perfect idea for outdoors camping. That lake photo is so tranquil! You mean burnt hot dogs are not the only camping dinner??? Who knew! I love the ingredient combo! I make something similiar for my I’m hunry and want something simple meal fix. 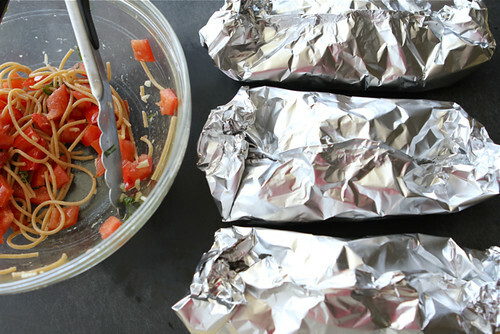 I love the idea of throwing it all in foil. Especially for a tasty campin’ dinner! Wow does this recipe look easy and tasty. The perfect anytime combination. Have a great camping trip. So smart to cook the pasta at home and I know my boys would love their own packets! This looks amazing! Since my kitchen is under construction right now I feel like I am camping at home, so these would be perfect!! I really don’t know how on earth I missed this before. This is SOOO amazing, Dara!!! I love the foil cooking method. I go glamping but a girl still needs some good grilled food so from now on, you are coming with me! LOVE how you prepared this camping pasta. I’m not a camper, but this recipe and preparation idea makes me want to be one!